Norman Dello Joio composed his celebrated Sonata No. 3 in 1947 for pianist Sidney Foster. It was recorded by Frank Glazer. Laura Leon performed it as part of her 2008 New York recital American Images From The Piano: Neo-Classic to Nature 1946-2008, honoring the late composer's 95th birthday that year. Mr. Dello Joio was unable to attend the upcoming recital. And so, a few months prior--in February 2008--Laura Leon and composer, colleague and dear friend Leo Kraft, drove out to visit Mr. Dello Joio at his Long Island home, where they enjoyed a remarkable morning of company, conversation, and Laura's opportunity to perform his Sonata for him on the very piano on which he had composed the work 61 years earlier. "Among established composers of serious music in this country, Norman Dello Joio is outstanding for an outgoing directness of expression and a simplicity of manner, if not always of means, which have an intentionally broad appeal. A strong melodic vein, rhythmic vitality, a relatively restrained harmonic vocabulary, an infectious brio and freshness of invention, are among the earmarks of his style." Of the Fourth Movement of Dello Joio's Third Sonata he wrote: "The finale (4th movt) returns to the thematic material of the Variations, Chaconne and Finale (1st movt), but the treatment is somehow more modest, fresher, brilliant." 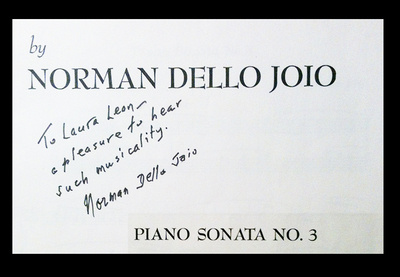 Before leaving, Mr. Dello Joio signed the title page of the Sonata, his words cherished from that moment on. Recorded live by Joseph Patrych, Yamaha Piano Salon, April 13, 2008.